Ideal is in the “Good Weather” business. Long lasting durable products keep you dry, dramatically reduce energy and maintenance costs, plus they’re beautiful. Ideal has covered thousands of Houstonians since 1987. Attention to detail, quality products and quality craftsmanship is key. That’s why Ideal Roofing is my choice for roof replacement and roof repair. 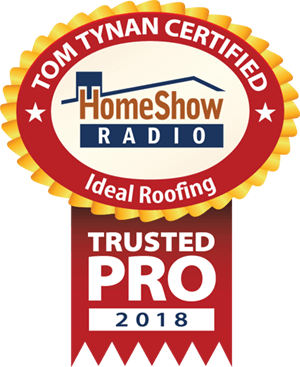 Serving the Greater Houston area, Ideal Roofing is a trusted HomeShow Pro, certified by HomeShow Radio’s Tom Tynan. How can Ideal Roofing help you? • Surprisingly easy ways you can prevent roof damage. • Does your home have a roof leak in the making? Probably so. • Does new technology cure the curse of sneaky leaks on flat roofs? • Is too much roof ventilation bad for your energy bills?